Shelters can be very stressful places for cats, leaving them prone to physical and behavioral problems like weight loss, over-grooming, self-trauma, aggression, withdrawal, bladder problems and upper respiratory infections. In addition to the suffering experienced by the cats, such problems reduce their chances of being adopted quickly, creating a vicious cycle that can be hard to break. The best idea for reducing stress in longer-term shelter residents is to not have them in the shelter at all. Foster care can promote the mental, physical and emotional well-being of long-term residents. A home environment with routine social interaction and more space and opportunities to express natural behaviors can be critical to reducing a cat's stress level. This holds true for cats who display undesirable behaviors while in the shelter, or who just don't interact well with the public in a shelter environment. Fostering often brings up any number of common questions, each of which is valid: How will they get adopted if they are not on view to the public? Won't it be more stressful for them if they have to come back to the shelter later on? Ideally, cats will stay in their foster home until they're adopted, not just for a short "de-stressing" period, or while a medical problem is treated. Fosters should be empowered to take an animal completely through the adoption process, without the cat ever having to return to the shelter at all. Developing a program for adoptions out of foster care for longer-term residents requires recruiting, training and retaining fosters who understand they are making a long-term commitment to the animal. Developing marketing strategies for these pets is crucial, and should make good use of the Internet and social media as well as "old school" approaches, such as flyers and both classified and display advertising. Involving volunteers who are good at writing pet bios, taking pictures, and posting on websites and social media is a great way for shelters to include the talents of more of their community and allows those who aren't able to take an animal into their own homes to help pets. A foster program of this sort should also have a plan in place for ongoing medical care and support as needed. This can be provided through the organization's veterinarian(s), through arrangements with general practice veterinarians in the community, or a combination of the two. Foster parents need to know they will have medical support as needs arise. If foster care isn't available, animal shelters must ensure the Five Freedoms of Animal Welfare are being met for each pet, especially for those expected to be in the shelter for some time. One of the best ways to reduce the stress of a long shelter stay is to shorten it through a "fast track/slow track" approach. In this system, animals who shelter staff estimate will probably be quickly adopted are moved into their new homes as quickly as possible. These are the "fast track" animals. Those who probably will not be adopted within one to three weeks - typically those who are older or who have medical and/or behavior challenges - are designated "slow-track." These cats should receive special attention and care to keep stress from escalating, right from the very start of their stay - not after stress symptoms have begun to take their toll. Those approaches are outlined below, and include low-stress cage cleaning, foster homes, improved housing strategies and enrichment activities. Sanitation is always important in animal shelters, but some methods of cleaning actually increase stress levels in cats, defeating the health benefit of sanitation. In most shelters, cats are kept in a carrier or hold box while the cage is cleaned. All the bedding is emptied daily and harsh disinfectants are used. Consider this from the point of view of a cat, however. Not only are they frightened and stressed during the entire process, familiar scents and bedding are replaced with new, unpleasant smells. What's worse, one of the ways cats calm themselves is by rubbing their cheeks on surfaces, leaving a scent that they find soothing. Take away the bedding and scrub the cage, and all that benefit is lost. Instead, spot cleaning allows the cat to be kept in a carrier inside the cage, or in a different section of the cage, separated by a closed porthole. During spot cleaning, a mild cleanser, such as soap and water, is used to remove any food or feces from the floor and walls of the cage. Bedding that has litter and debris is shaken out but not replaced. Any remaining debris or stray litter is removed, and the litter box is then changed. Before the cat is re-introduced to the cleaned area, fresh food and water are provided. Only once a cat leaves a cage due to adoption or fostering is the cage fully disinfected. Of course, should bedding become soiled or wet, it should be replaced, but many cats retain their bedding for extended periods of time without incident. Such an approach creates an atmosphere that is more like home, eliminates most of the episodic use of harsh chemicals that can be aerosolized, which in turn reduces repertory issues in susceptible cats. Cats have the reputation of being loners, but that doesn't mean they want to huddle alone in a cage all day and night. Cats frequently show signs of reduced stress, better health and easier adoption when they're housed in group settings with other cats. Additionally, part of what makes shelters difficult environments for cats is their natural tendency to roam, jump, and perch in high places. Standard animal shelter cat cages of 20" x 28" don't even come close to providing them that opportunity, compounding their stress levels. This frustration of their natural instincts and normal behaviors is one of the main causes of stress-related illness and behavior problems in shelter cats, and any interventions that can allow cats to express themselves can be a valuable tool for increasing adoptions while decreasing stress. Group housing typically provides opportunities for cats to exhibit their normal behaviors like running, jumping and playing. Vertical space can be added through wall perches or cat trees, letting them express their need to climb and perch. Cubbies, paper bags and other chill-out spots give shy cats or those who just need a break from the group or a place to hide. Of course, it's important not to over-crowd these spaces, as too many cats in one room will increase stress and defeat the purpose of group housing. Staff members should also be on the lookout for cats who show signs of stress in group settings, as some cats really do prefer a room of their own. Even if group housing isn't available, or a slow-track cat doesn't do well in it, fairly simple and feasible modifications to traditional cages can greatly benefit cats. The simplest of these is to provide a raised bed. A raised bed increases the usable space in an otherwise small cage by adding elevated square footage where a cat can rest, lounge, perch and sleep. A litter box can be underneath, allowing more floor space for the cat to move and play in, and to have food and water further away from the litter box. Information on where to order these beds, and has instructions on how to build them yourself, can be found on the UC Davis Koret Shelter Medicine Program website. Another option is to create a pass-through in double compartment cages. This allows for complete separation of the living area/eating area from the litter box, which both increases the square footage available to each cat and reduces stress. The UC Davis site has instructions on how to create a pass through compartment here. For long-stay cats, extra attention must be paid to keep stress levels down in cats. Enrichment and interaction with staff and volunteers is critical for their mental health. Almost all cats will benefit by having time in a play space where they can run, stretch, and have interaction with people. This space can be a separate room (best for shy cats), or the floor space in the room where the cat's cage is located. Volunteers are essential for playing with cats, providing grooming, or sharing whatever activity the cat prefers, including just sitting and reading with the cat on their lap. 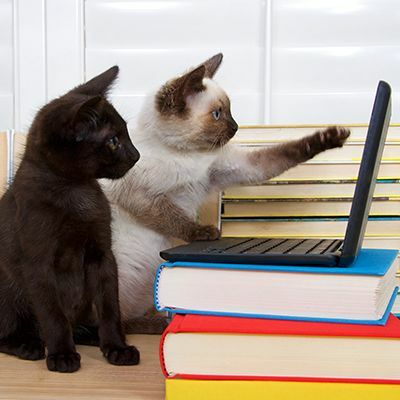 Volunteers can also teach these cats different tricks like "high five" or "shake," learning from videos like this one, which has the "paw of approval" from Maddie's Fund Director of Research Sheila D'Arpino, DVM, DACVB. These behaviors are great ways to market these animals to the public - who doesn't want a cat that can do a high five? One of the top goals of any shelter should be to move all cats into a permanent or foster home as quickly as possible. Becoming aware of the needs of longer-term residents and taking active steps to reduce stress through enrichment programs and the use of foster homes will increase the speed with which they're adopted, and decrease the likelihood they will develop stress-related physical and behavioral problems.